From helping you speed up your cycle times to saving valuable seconds in an emergency, there are a number of benefits to installing a high speed garage door in your facility. 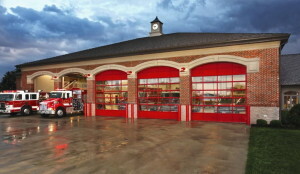 High speed garage doors are used in busy shipping centers and manufacturing facilities, as well as police and fire dispatch stations and other emergency response settings. Replacing a conventional garage door with a high speed unit can give your business a competitive edge, or potentially save a life. O&L Door Systems is a leading provider of high speed garage doors for Burnsville and Eagan, MN businesses. We have a great selection of products as well as the engineering expertise necessary to design and install a superior system. High speed garage doors open and close at speeds up to 100 inches/second. That’s almost 15x faster than a conventional unit! For a large commercial garage door, that extra time makes moving products and materials faster and more economical. It also reduces idling time for your trucks, lowering both your fuel costs and your environmental impact. Do the math, and you’ll see — an investment in a high speed commercial door is one that will deliver long-term benefits for years to come. Get in touch with O&L Door Systems to have one of our team members run the numbers and demonstrate just how much time you can save. High speed garage doors have to work harder than conventional units — if not properly cared for, they can wear out faster as a result. Add to that the fact that the benefits of a high speed door are completely eliminated if that door isn’t working properly, and it’s clear that expert service partnerships are necessary. O&L Door Systems can provide service for high speed garage doors in Burnsville and beyond. We offer preventative maintenance packages, warranty repairs and emergency service that can get you back up and running in no time. Our team is available around the clock to respond to incidents as soon as they happen — one call to our head office is all it takes. Get in touch today for all your high speed garage door service needs.